Jeff Thompson chats with two blind individuals in the sporting world. first he talks to Phil Hubbard, a member and Official of the US Blind golf Association about the organization, its members, rules and how he got involved. A great story and something we might all consider engaging in! 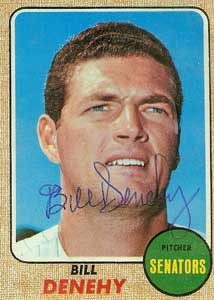 Next, Jeff chats with Bill Denehy, a former Major League Baseball Pitcher who entered the Majors back in 1964. Bill talks about his ride in “The Bigs”, his lifestyle, his contemporaries, he shares a little about how he lost his vision, and some advice to those facing similar challenges. And sit back and relax as bill entertains us with his stories about Major League Baseball.